Firewise offer professional fire safety training and fire safety risk assessments in Dorset, Hampshire, Wiltshire and the South of England. Firewise are experienced fire safety consultants who've been delivering tailored fire safety solutions to large and small businesses for many years. and offer a Free Fire Safety Health Check of your business premises included as part of any of the above services! 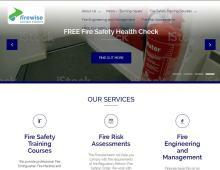 Contact Firewise, whose great reputation is shown by the feedback they receive from clients, for your Fire Safety Training and Fire Risk Assessments in Dorset, Hampshire, Wiltshire and local areas.